• 50+ inspirational real-life weddings! • 1987 perfect details to complete your day! • New year, new you with easy slimming recipes! • Best buys for 2015 – accessories under £10! • Win a honeymoon to the USA and much more! • Must-ask questions before you book! • Wow dresses for 2015! Congratulations to all the new brides-to-be, and welcome to the Wedding Ideas clique. Here you'll find EVERYTHING you need to know in order to plan your perfect day, without overspending. Did you get engaged on Christmas Day? Or maybe on the stroke of midnight on New Year's Eve? Let us know your proposal story! This issue, brides can take advantage of a whole host of fabulous discounts and prizes (page 181), as well as amazing competitions including beautiful bridesmaid dresses (page 95), a honeymoon to Florida (page 306) and much more! I love our New Year's Resolutions feature this month where you can get in shape and save money at the same time (page 174)! And talking of weight-loss, the Slimming World recipes from page 111 are mouthwatering and guilt free, too! 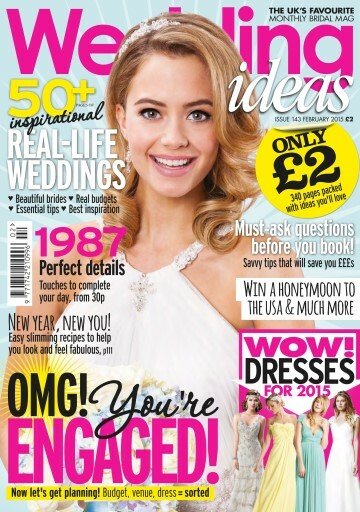 I know I say it every month, but we really do have the BEST real brides, and we're lucky enough to exclusively share the inside story of their big days with you (page 119). So inspirational – keep them coming!